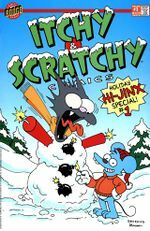 Itchy & Scratchy Comics comics was a comic book series centered on Itchy & Scratchy, first published in the United States in December 1993 by Bongo Comics. The last issue was published in November 1994. Modified on July 25, 2017, at 10:25.